Audience: Newer or beginning level shotgun owners to experienced shotgun shooters looking to improve their defensive shotgun shooting/handling skills in their home or wherever it may be needed to defend yourself/loved ones. Scope: This course is for shotgun shooters looking to learn the safe and efficient use of a shotgun in any environment. 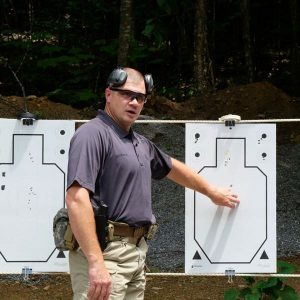 Classroom instruction and practical exercises on the range will ensure that all concepts taught to the student are understood and they can utilize them at the appropriate time. More experienced students will refine their current skills in order to progress them as better shooters. Participants should be prepared to train in all weather conditions. This program can be challenging and participants should come to class with an open mind and a good attitude. Keep in mind we will be firing the shotgun a lot during the course, we recommend a recoil pad or properly fitted shotgun. With our personal approach to training, low student to instructor ratio, your skills and knowledge will improve! This is an 8 hour training day 8:30 am to 4:30 pm with 30 minutes for lunch. It is highly recommended that you bring your lunch as you will have no options within 15 mins of the range. It is also recommended you have snacks, some will be available such as power bars and granola bars. Otherwise, please bring your own. Light hiking boots or running shoes. NO open toed shoes allowed! 200 Rounds of 2 ¾ inch, #7.5 or #8 birdshot, recommend light loads.